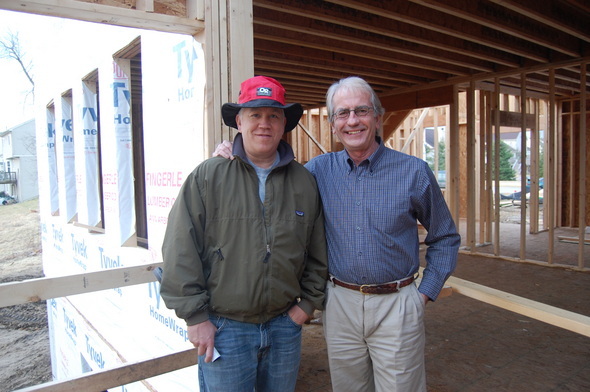 Homeowner Patrick Schutte (on left) stands with Alex de Parry of Ann Arbor Builders at the site of Schutte's new Dexter house, which is being constructed mostly of materials made in the U.S.
As Ann Arbor Builders Inc. hops aboard the slow train to economic recovery, the company wants to bring along other American businesses. It’s been a tough four or five years, admitted Betsy de Parry, vice president of Ann Arbor Builders. The 40-year-old home construction company saw business drop from 20 to 30 new home starts a year to three or four since 2007. But as the phone begins to ring again with inquiries and there is a growing number of signed contracts, de Parry said she and her husband, Alex de Parry, company president, are focusing on building homes with products made in America — with a special emphasis on products from Michigan and Washtenaw County companies. At the same time, Patrick Schutte had a dream of building his own house from the ground up, getting it just the way he and his wife, Heather, wanted it. But Schutte wanted it to be American-made. That’s when he found Ann Arbor Builders. The family's four-bedroom Dexter house will be the first new project built under Ann Arbor Builders’ focus on using American-made goods. Except for the granite countertop, the microwave oven and the recessed lighting, everything will be made in America, down to the nails. Construction started in January, and the family expects to move in this summer. The project won a few seconds of national attention this week when it appeared on an ABC network news segment about the economy heating up, adding 52,000 new construction jobs in the past two months, compared to 32,000 new jobs in all of 2011. While the de Parrys had paid little attention to the sourcing of their home building products until a few month ago, it turned out many items already came from the U.S. Still, they knew they could do better. After they learned from the Boston Consulting Group that 220,000 more new jobs would be created if every builder in the country increased American-made products by 5 percent, they decided to make the effort. “If everyone did it, it would add up to be a pretty big thing,” Betsy de Parry said. Alex de Parry, who also serves as vice president of the Builders and Remodelers Association of Greater Ann Arbor and was previously involved in the development of the controversial City Place project on South Fifth Avenue, created a comprehensive list of all the materials that went into building his houses and turned to his suppliers to find out where the materials were made. The nails had come from China, but they found an Illinois company called Maze Nails. Most of the silt (fabric) fencing temporarily installed around the perimeter of the lot to thwart erosion comes from China. But the de Parrys found a company on the west side of the state that manufactures it. They looked to Ann Arbor's Fingerle Lumber Co. in Ann Arbor to source U.S. fasteners. While most electrical panels are made in the Dominican Republic, their contractor found a source that uses mostly American-made products. Lumber was a challenge. Most of it came from Canada. But the de Parry’s eventually found a source close to home, buying from a Michigan supplier with Michigan lumber. Still, a few items were impossible to find. All microwaves, Betsy de Parry said, are made in South Korea. There are no American-made recessed lights. And most granite comes from abroad, mostly from Brazil and Italy. But there are made-in-America alternatives for countertops, such as Corian by DuPont and Cambria quartz, she said. “If a house doesn’t have a microwave, granite countertops or recessed lights, it can be 100 percent American-made,” she said. About 95 percent of the materials going into the Schutte house are made in America, Alex De Parry said, with between 20 and 30 percent made in Michigan. Sticking to U.S. products increases costs between 3 and 5 percent, he said, a cost the company absorbs. The project found its way to a segment by David Muir on Diane Sawyer's "World News Tonight" after an ABC producer contacted Betsy de Parry via her company’s Facebook page Tuesday afternoon. ABC asked if it could make a “Just Hired” sign and shoot video footage of Alex standing in front of Schutte’s house. Janet Miller is a freelance reporter for AnnArbor.com. Fri, Mar 23, 2012 : 11:36 p.m.
To Go Blue -- Please check your facts and make sure you have the story straight before you start posting comments. Ann Arbor Builders tried to save Heritage Row. This company was not involved with the removal of the houses and did not construct the building that took its place. Lets end the discussion there. Fri, Mar 23, 2012 : 6:14 p.m.
Is this the same builder that owned the houses near downtown Ann Arbor that were demolished to make way for student apartments? Fri, Mar 23, 2012 : 3:30 a.m.
Fri, Mar 23, 2012 : 1:45 p.m.
Ann Arbor Builders, led by Alex and Betsy De Parry, are one of several members of BRAG Ann Arbor who are making an effort to include more Mid-west components in their projects. This may seem like a rather simple thing to do, but it is actually fairly difficult, because so many items are composed of multiple items from multiple sources. I applaud the De Parrys for making the effort to buy locally. HSA Remodeling also makes an effort to buy local, but it is more difficult with remodeling because one often needs to match existing materials. However, we try as do several others, and we rejoice in this awakened awareness. Thu, Mar 22, 2012 : 7:41 p.m.
Just out of curiosity, just how much framing lumber, concrete blocks, asphalt shingles, concrete, nails and other building products is imported anyway? I can't imagine many companies are loading up container ships full of bricks to send over here. It seems that building products in general are too bulky, heavy and cheap to be viable imports in the first place. Even Chinese drywall, which supposedly was offgassing toxins in some homes a few years ago, was brought in largely because domestic companies couldn't keep up with the demand during the housing boom. Sounds like these guys are making a virtue out of necessity. Thu, Mar 22, 2012 : 3:05 p.m. I can't understand how a microwave oven, granite countertops and recessed lights make up 5% of the materials in a four bedroom house. Thu, Mar 22, 2012 : 2:05 p.m. I would like to build a house 100% Made in China, and be your neighbor next the door. Thu, Mar 22, 2012 : 2:03 p.m. Nice!!! That's what I'm talkin' 'bout!!! Thu, Mar 22, 2012 : 2:01 p.m.
Now if Ann Arborites bought the Ford, GM, and Chrysler there would be new customers for this business. And don't even mention the Hyundai and Toyota - 300 jobs - geesh. That would'nt even pay for you gas nowadays! Thu, Mar 22, 2012 : 2:19 p.m.
Thu, Mar 22, 2012 : 1:49 p.m. I salute Ann Arbor builders and the Schutte family! Very nice. Those two guys in the picture look proud, as well they should be. They get it. Thu, Mar 22, 2012 : 12:34 p.m.
As for granite, the most beautiful red granite can be found in the quarry near Ortonville, Minnesota and probably obtained from there. There is a church in that town made from that red granite that is a beautiful sight to behold! Thu, Mar 22, 2012 : 12:25 p.m.
And if these houses can be built better than most of the houses built since the early 90's...all the better. As an owner of a home built in 1996 that comes apart in a normal windstorm, I couldn't help but wonder if the extent of the damage (200 homes) was more a funtion of poor construction as opposed to strength of the tornado. Photos of the damage show new 2x4's, partical board, and plastic sidding scattered all over the place while cars sat on driveways relatively undamaged. Usually an F3 will show more tree damage and car movement. The upside...most all new homes have basements which likely had much to do with low injury rate.